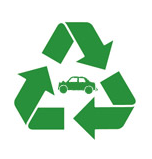 Not only does scrapcaredmonton.ca PAY to dispose of and recycle your unwanted natural end-of-life vehicle(s), we also pay up to $5000 (IN CASH) for vehicles that are not end-of-life (premature end of life). How can you tell if your vehicle is End-Of-Life or Not? If your vehicle Runs, Drives, and is in Great Working Order. If your vehicle is relatively new, but unusable due to an accident or major mechanical failure. Example: A 1990 Any Make, Any Model vehicle that will not pass government inspections due to rust issues or other safety related issues would then be deemed “End-Of-Life” these vehicles will be deemed End-Of-Life because their highest value for resale would still be lower than the total cost of repairs they require. However, a 2002 Any Make, Any Model vehicle that has been taken off the road because of a minor accident or large mechanical failure (i.e engine failure, transmission failure) can be worth up to $5000 (in CASH) depending on its parts resale popularity. Salvage, accident damaged, cars, clunkers, trucks & vans. Highest Cash Paid in Calgary Guaranteed! Make that call & retire your ride today! It’s very simple – We do everything for you, PLUS, pay YOU big ca$h On-The-Spot! We safely remove your unwanted vehicle. Our service is the fastest, most reliable, dependable & hassle free. Our drivers are kind, courteous, professional, honest, highly skilled & very helpful – That’s a Guarantee. We also buy good, clean vehicles – We pay top price. We try not to let any scrap car go un-puchased which comes in our way. So we never hold back from paying big amount of cash. We beat any other offer you would get.